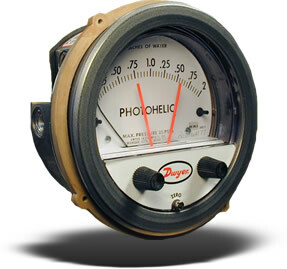 Combines differential pressure gage with low/high set points. Gage accuracy is ±2% of full scale and switch repeatability is ±1%. Switch deadband is one pointer width - less than 1% of full scale. Compatible with air and other non-combustible, non-corrosive gases, they can be used in systems with pressures to 25 psig (1.725 bar). Optional construction is available for use to either 35 psig (2.42 bar) or 80 psig (5.51 bar). Accuracy: ±2% of full scale at 70°F (21.1°C). ±3% on -0 and ± on -00 models. Pressure Limits: -20" Hg to 25 psig (-0.677 bar to 1.72 bar). MP option; 35 psig (2.41 bar), HP option; 80 psig (5.52 bar). Process Connections: 1/8 female NPT (duplicated side and back). Electrical Connections: 18" (46 cm) cable assembly with 8 conductors. Optional lengths to 100´ (30.5 m). Switch Type: Each setpoint has a solid state relay. Switching Voltage: 20-280 VAC (47 - 63 Hz). Switching Current: 1.0 amp (AC) max., 0.01 mA (AC) min., (2) SPST N.O. Electrical Connections: 18" (46 cm) cable assembly with 6 conductors, Optional lengths to 100´ (30.5 m). -TAMP Tamper-Proof Knobs, require special spanner-type key (included) to adjust set points. -LT Low Temperature Option for use under 20°F (-6.7°C). -MP Medium Pressure increases maximum rated pressure to 35 psig (2.41 bar). -HP High Pressure increases maximum rated pressure to 80 psig (5.5 bar). Model Number Range, Inches W.C. Minor Divs. MR or MRS suffix to Series 3000 number.